Stay in a home steeped in history. Wander the hillside trails in search of wildlife. Enjoy traditional home cooked meals. Relax in the botanical gardens. Look out over beautiful scenery. Reilly’s Rock Hilltop Lodge is an quaint historic colonial homestead and it is the perfect base for exploring the region, or even as an overnight stop on your travels. The lodge is surrounded by lush gardens filled with aloes, interesting plants and it is alive with birdlife. Built in the early 1900s by Mickey Reilly, it is still in the family to this day and they have been pioneers for conservation and wildlife in eSwatini. Four bedrooms are located in the main house, each each with doors opening out onto the verandah where you can enjoy the gardens. All rooms are en-suite and individually decorated and furnished in keeping with the colonial architecture and history of the building. Adjacent to the house is a cottage where you will find 2 more rooms and a lounge complete with fireplace. The main house is home to the communal dining room and a living room, these rooms also have fire places which are lit at night to ward off any chills and it adds to the cosy ambience of the lodge. Throughout, the lodge has been thoughtfully decorated with charming interiors echoing the history of a bygone era. Mlilwane Wildlife Sanctuary is home to a variety of wildlife including hippo, giraffe, zebra, blue wildebeest, kudu, nyala, impala, warthog and crocodile, to name a few, you may even be lucky enough to see a leopard, but they are fairly shy. Game drives and guided bush walks can be organised, alternatively you may prefer to explore the area on a horse or a mountain bike. Open: Reillys Rock Hilltop Lodge is open all year. Location: The lodge is within Mlilwane Wildlife Sanctuary, about 26km from Mbabane. Rooms: The lodge has 6 en-suite rooms and also a self-catering cottage that sleeps 7. The en-suite rooms are individually decorated in keeping with the colonial style of the building but with modern amenities. Activities: Exploring the great outdoors on foot, by bike and on horseback. Go for strolls in the gardens, bird watching and admiring the flowers. 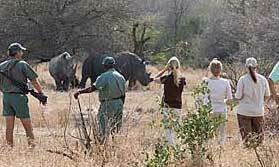 Cultural visits to a nearby village and game drives can also be arranged. Facilities: There are spacious grounds and beautiful botanical gardens. There is also a communal lounge and dining room in the main house. An excellent combination of game viewing on foot, and leisurely days on the beach in South Africa.